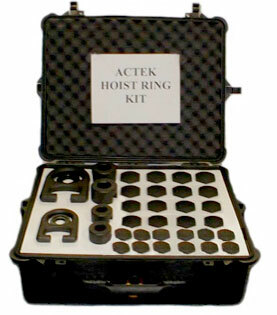 Actek Forged Swivel Hoist Rings Kits enable you to custom assemble just the right swivel hoist ring for the job. Kits are available in standard and metric sizes; and come complete with U-Bar (body and sub-assembly), screws, bushings, washers and E-rings – enough to configure 20-24 different hoist ring sizes and capacities. A handy accessory kit for lifting and moving heavy loads, and a must for your tool crib.